Yes, I’m going Joyce Kilmer on you. It’s National Poetry Month. How could I not start with the opening of a poem we all learn in primary school? The Academy of American Poets, inspired by the success of Black History Month and Women’s History Month, created National Poetry Month in 1996. It is the largest literary celebration in the world and UCF Library is proud to do our part. We gathered suggestions for 20 books of poetry that are currently in the UCF collection. These works represent a wide range of favorite poetry books of our faculty and staff. Click on the link below to see the full descriptions and catalog links. April is National Poetry Month and the UCF Libraries are springing headlong forward to celebrate. Ode to a Library – Submissions due by April 14, 2017 at 11:59 pm. Haiku by You – Submissions due by April 21, 2017 at 11:59 pm. Winners will receive a Library Superpowers T-shirt and be published in STARS KnightVerse. 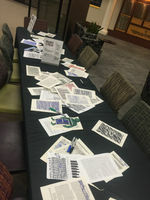 An Erasure Poetry table will be set up between the Circulation Desk and Reference Desk from April 3 – 7. Staff favorites will be displayed on the windows by the entrance and on library social media accounts. The UCF Libraries Tumblr account will feature daily poems which are favorites of library staff. Tag us in your favorites on Tumblr! Join us for the last Open Heart Open Mic of the semester on Tuesday, April 18th from 12-1:30PM in John C. Hitt Library room 223.